Join VBA's Progress and Results Webcast on Thursday! This week is the quarterly webcast hosted by Paul R. Lawrence, Ph.D., Under Secretary for Benefits, on January 31 at 2 p.m. ET. 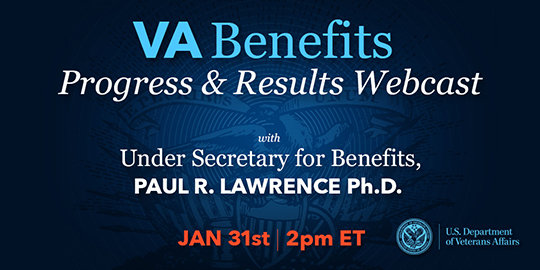 During the webcast, Dr. Lawrence will discuss the Veterans Benefits Administration’s progress in the first quarter of Fiscal Year 2019. He will be joined by Dave McLenachen, Executive Director of the Appeals Management Office, and Charmain Bogue, Acting Executive Director of Education Service, who will share information about appeals modernization and updates to the GI Bill. You’ll also hear Dr. Lawrence respond to questions from Disabled American Veterans and Wounded Warrior Project.